There has been quite a lot of discussion going on recently regarding the lack of women invited to ITF Paris this year. Most of these discussions have been going on via social media websites like FaceBook, the online trombone forum, and articles have even started popping up on The Huffington Post. It is interesting to read the wide array of comments that these discussions elicit. Most people are outraged, some pretend that the issues don’t exist, and some even defend M. Mauger’s actions and assert that Abbie Conant is sexist in her remarks. For the record, I could not disagree more with the last statement. Is it possible that M. Mauger is receiving too much flack for his actions? Some may think so. The fact is, is that this is not an isolated problem. Women have been excluded from the past four ITFs as soloists, with an exception of one female soloist in Austin. Have we as women grown numb to the fact that we have not been included or invited to this “boys only” club? I think that may be the case. Well, we are not numb anymore, and unfortunately for M. Mauger, we decided to bring awareness to this issue when he was organizing the festival. I think that some people do not agree with how all of the information was shared and discussed. I’m sure that some people regret heated statements that they made while feeling very brave behind a computer screen. I very much disagree with the attitude that women have made such a stink about this for the sake of making a stink– that we will never be happy with any decision that comes out of this. Some even accuse us of making this only about gender and that it should really be about the music. Women and enlightened men do have a right to be offended by the lack of women involved in ITFs. We are not bringing this situation to light because we want something else to complain about. We are making a big deal about the current situation because it is in fact a big deal with even more serious implications and consequences for out organization’s future. As far as “getting back to the music,” I wish that it could be as simple as that. Unfortunately, the increasingly sexist actions of our leaders make this goal hard to achieve. I attended my first ITF last year in Nashville. As a woman, I definitely felt somewhat out of place in the swarming sea of men at this festival. Luckily, I had friends and colleagues to attend the events with, but if I hadn’t, I would have felt like an outsider. I did find it strange and even confusing that there were no female soloists. I was one of two women in a participant trombone choir. While I could probably count on one hand the number of women that were members of performing ensembles, it is not just about numbers. The hopeful outcome to result from these discussions is not to have a few token women invited last minute to ITF this year. While the numbers help to give us a better idea of the trends, they are not the most important thing. What the ITA and ITF need is a revamped attitude towards women in music. It is also necessary for these organizations to change their overall culture, for they are headed towards a rocky path. Abbie Conant mentions in her recent commentary that these organizations need to move away from the celebrity based leadership back towards a more educationally based form of leadership. That is the primary mission of the ITA, after all. Here is a short excerpt from Conant’s article, but you should definitely read the whole thing. She really addresses the more serious issues that have resulted from sexism and discrimination in the brass world. Over the last decade, the ITA has tried to compensate for years of insiderism by positioning famous trombonists in the executive committee and Board. The number of university teachers among the officers and Board was significantly reduced and replaced with people in top orchestras, military bands, and well-known jazz/commercial players. Even though this improved the ITA’s image of professionalism, celebrity culture has an inherent tendency to create a narrow, dominate culture in the center that marginalizes important aesthetic and social view points. As a result, the ITFs have recently tended toward a dichotomous division between a small group of stars and the groupies who worship them. We have thus seen a corresponding loss in the ITA’s and ITF’s educational, social, and artistic dimensions. A closer cooperation with our European colleagues has created a new and extremely important kind of diversity in the ITA, but as we have seen in the last two European ITFs, it has also brought with it some forms of ignorant, provincial chauvinism that segues in unfortunate ways with the problems already created by the ITA’s excessive celebrity culture. * As a result, the ITA has not been able to give European ITF hosts the guidance they have clearly needed to create appropriately diverse festivals. And finally, these narrowed perspectives continue to leave some very serious, long-term problems unaddressed. One of the worst is the sexual exploitation of students by a few star players and members of top orchestras – a problem that has recently affected even the ITA Board. This sexual abuse of students is yet another manifestation of our excessive celebrity culture in the brass world. I want to make some corrections because of imprecise information on the internet about women at the Festival in Paris. While women are certainly much less numerous, they will absolutely not be absent from the Festival. Such a proportion is not the result of personal choice or the will to evict women. Most artists of the Festival have offered to participate. Of the around twenty requests to perform at the Festival I received, no one have emanated from women trombonists. I asked the only French woman professor and soloist of international acclaim to perform, Ms. Yves-Lise Girard. In addition, Ms. Astrid Nokleby will lead the Junior ITF. 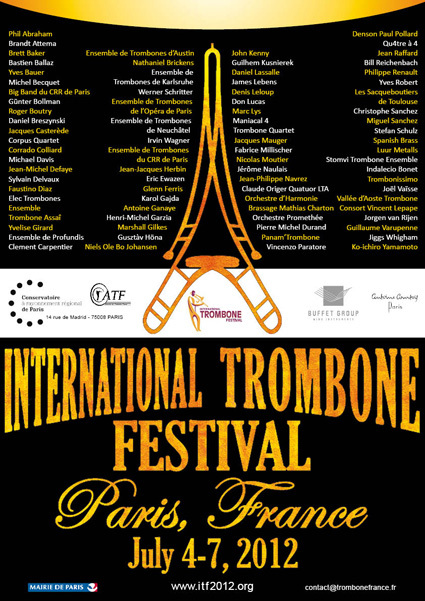 Over fifteen women trombonists will occur within various ensembles scheduled. You can, by attending the Festival, see it for yourself. While this may not be an entirely satisfying answer, at least it is something. It seems like more excuses to me and not apologetic in the slightest. I think that many trombonists are in agreement that there needs to be a change in our current culture of leadership. I have heard discussions about the possibility of forming a diversity committee in the ITA. I think that would certainly be a great start to instigate much needed change.